What does the sea mean to you? Enjoying fresh, salty air? Visiting beautiful beaches and remote islands? Perhaps a livelihood from fishing, sailing or diving? Maybe the chance to encounter seabirds or dolphins or to eat freshly caught, local seafood? These are some of the benefits people receive from interacting with the marine environment and they directly relate to our wellbeing by providing us with a sense of place and cultural identity. "...they directly relate to our wellbeing by providing us with a sense of place and cultural identity." The UK’s marine environment is home to a vast array of life, ranging from algae to zooplankton, and supports diverse types of livelihoods and recreational activities, many of which are at risk from threats such as over-fishing, infrastructure development and pollution. Managing these risks is challenging — multiple types of users may hold competing interests, which can lead to conflict and undermine management strategies. Understanding and incorporating the shared values of marine users into marine spatial planning can encourage bottom-up support for sustainable marine management. In 2017, the Centre for Ecology & Hydrology undertook a qualitative social science project in collaboration with the Scottish Association for Marine Science (SAMS) as part of the Marine Ecosystems Research Programme (MERP). We wanted to understand diverse views and identify potential management measures for the UK’s Celtic Seas. Our interviews were first used in an eight-minute introductory film about the project. Now we’ve created a longer film to present their views in more detail. Various topics were discussed to explore what people value about our seas, perspectives about marine management and associated benefits of marine experiences. National Security (food, fuel, mineral and energy resources are prioritised over nature conservation. Central government intervention is high). Around 40 hours of footage highlighted many shared values and competing interests among the diverse interviewees. The footage has now been compiled into a 35-minute documentary (you can read the script here). Around 40 hours of footage, now compiled into a 35-minute documentary film, highlighted many shared values and competing interests among the diverse interviewees. Key themes related to governance systems, human wellbeing and human impacts on ecosystems (e.g. pollution). Interview segments were selected to represent: each interviewee at least once; benefits derived from marine ecosystem services; a wide range of perspectives, including shared values and competing interests; and positive and negative views about the four storylines. Points of view not covered in the film were captured in broader analyses and presented to eight different conferences and meetings across the UK and in two scientific papers (so far). The film was launched on 26 October 2018 at a policy and management measures workshop in Glasgow to participants representing marine management across Scotland. 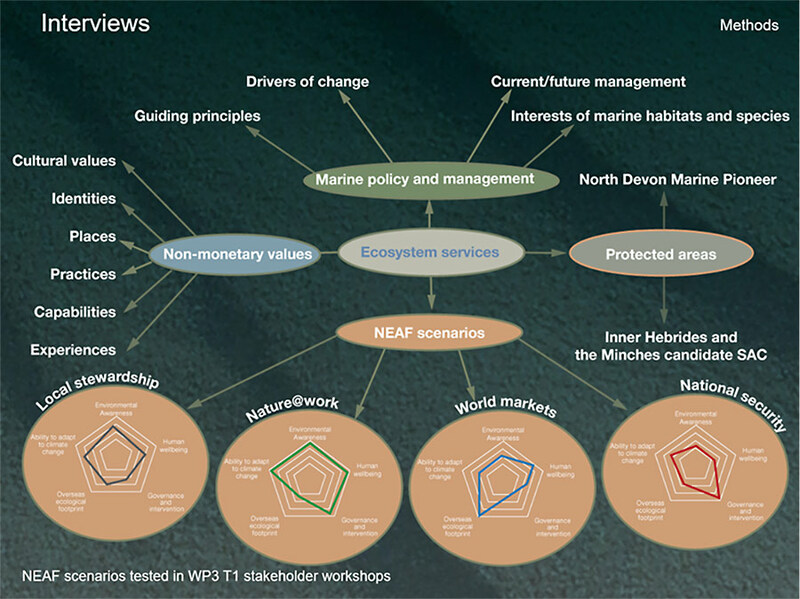 Modelled outcomes of different ecological and economic marine scenarios derived from six inter-linked MERP projects (Module 7) were presented, alongside the film which portrayed marine users’ values and perceived outcomes of the four different marine storylines. Participants were invited to deliberate on and prioritise a set of policy options according to ecological, social, economic and cultural criteria. For example, should overall fisheries regulation focus on quota control, catch effort or be unregulated (open access)? The overall results, integrating scientific and stakeholder knowledge and values, will be published. This will feed into regional, devolved and national marine policy post-Brexit. In the meantime, take the opportunity to watch our documentary film and hear some of the views we gathered.